Note the funky pixie wings. 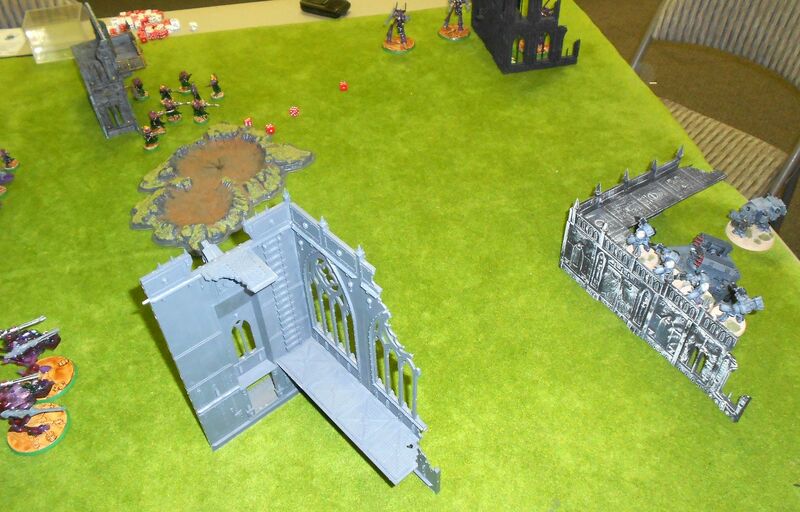 Managed to get my league game in with James' Eldar this past weekend. 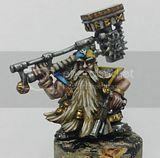 1250pts, Crusade, Hammer and Anvil. Going into the game he was the league leader, being undefeated so far. For this step he changed his list around, dropping the wave serpents to try other things out like swooping hawks and lots of rangers. I was worried about all of his armor-ignoring firepower, so was glad that we ended up with hammer and anvil deployment. Since we ended up with even objectives, I figured I would set up to try to use my 48" range weapons and stay away from all the 24/36 ranged death. 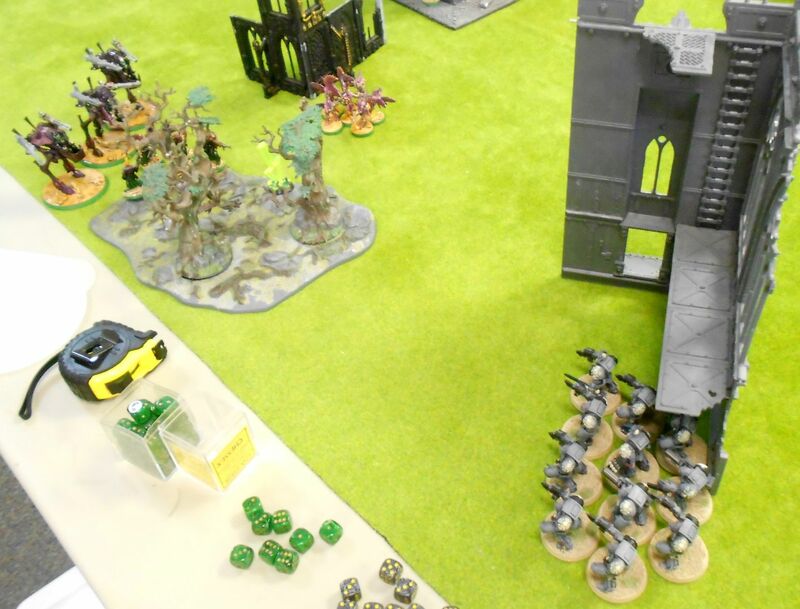 I covered the various things on my side and nearby terrain close enough to avoid infiltrators, and left my dread in regular reserve and Belial and big terminator squad teleporting in turn 2. He sets up one ranger squad, d-cannons and farseer in middle ruins on his side, and infiltrated other two units midfield. 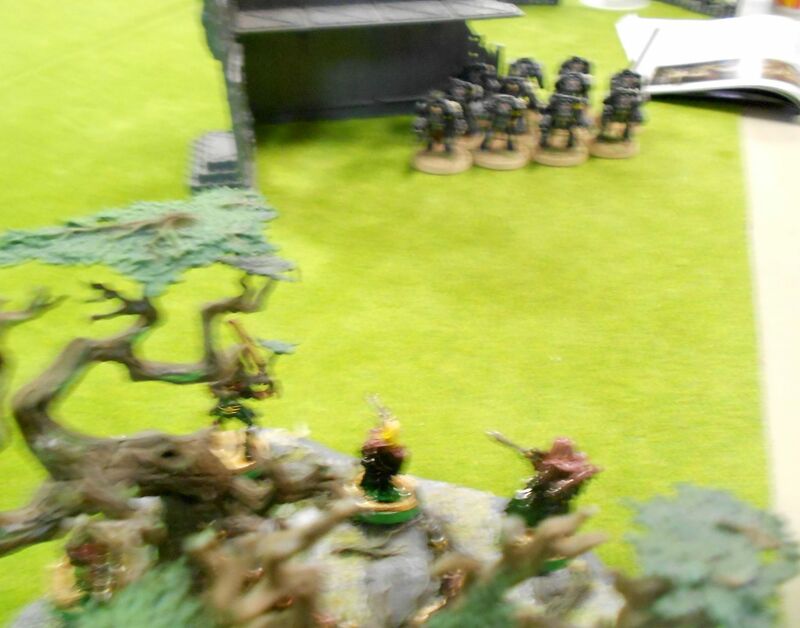 Warwalkers outflanking with the aid of Scryer's Gaze. Tacticals covering objective and denying infiltrators. 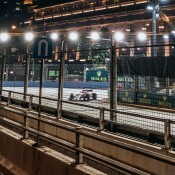 Turn one night fight, some minor shooting to little effect. Turn 2 big terminator squad arrives to put some pressure on ranger squad on objective but trying to stay away from d-cannons and limit other shots. Whirlwind drops on the rangers, other shooting kills a few too. Rangers break and fall back. With Scryer's Gaze, all Eldar reserves arrive. Rangers rally, shuricannon warwalkers and one hawk squad arrive to back them up. 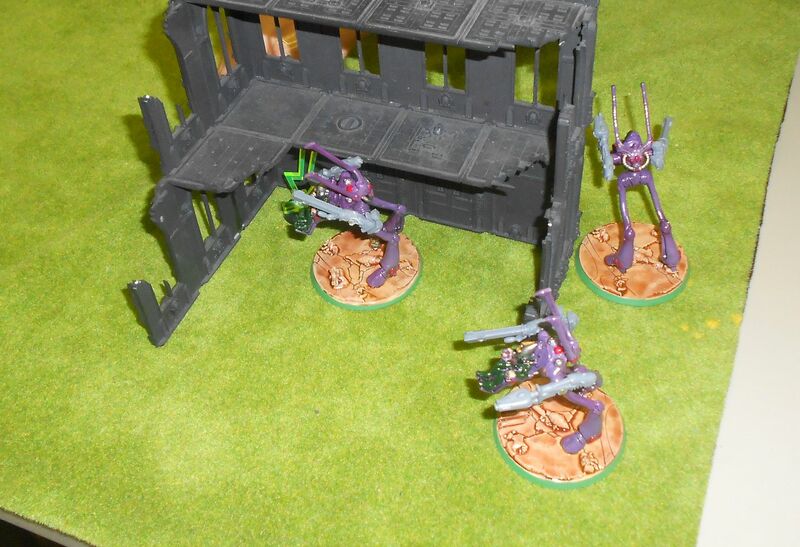 Other hawk unit lands by whirlwind. 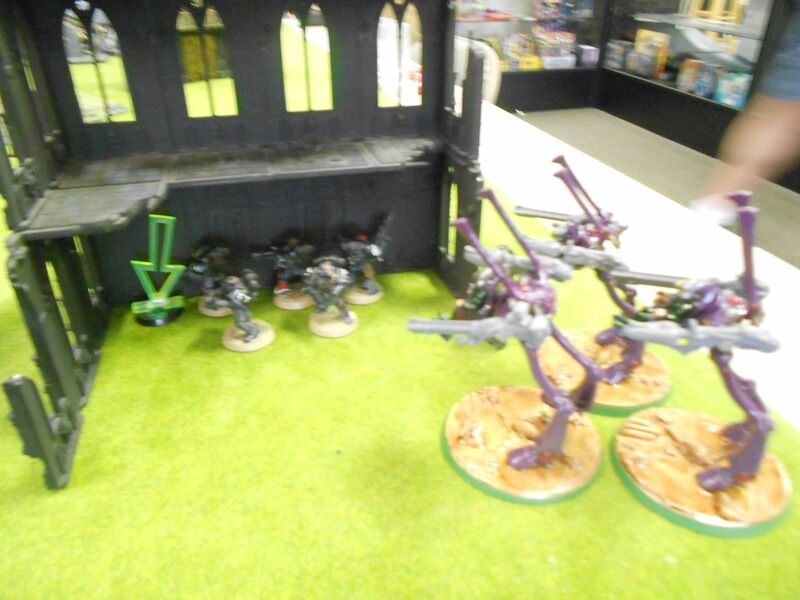 Starcannon warwalkers arrive to splat tactical squad. I think he originally wanted these guys to arrive on the other side to shoot up terminators, but 2,2,2 on the scryer's gaze outflank check said otherwise. I think it worked out better for him this way in the end. 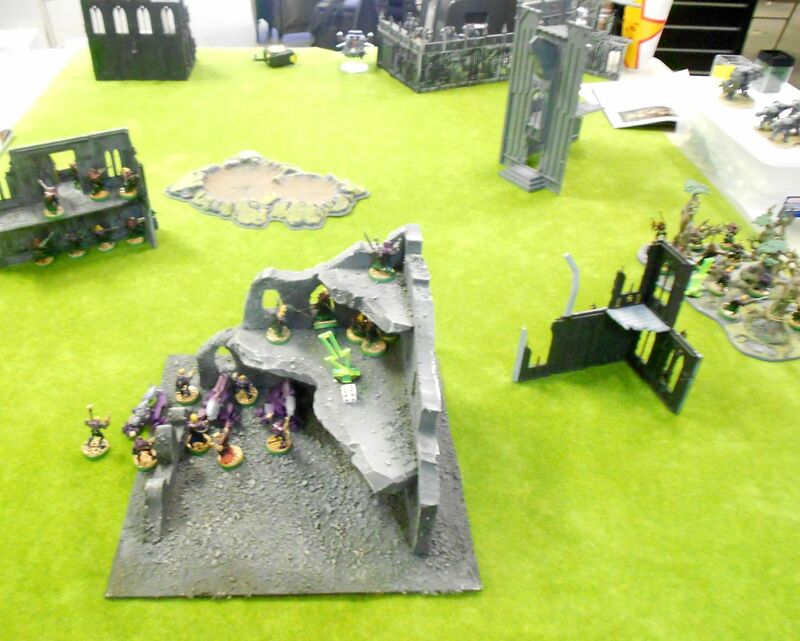 Belial's squad falls back behind the wall to limit fire, while the other squad approaches the nearby swooping hawks. Dread arrives to also menace them. 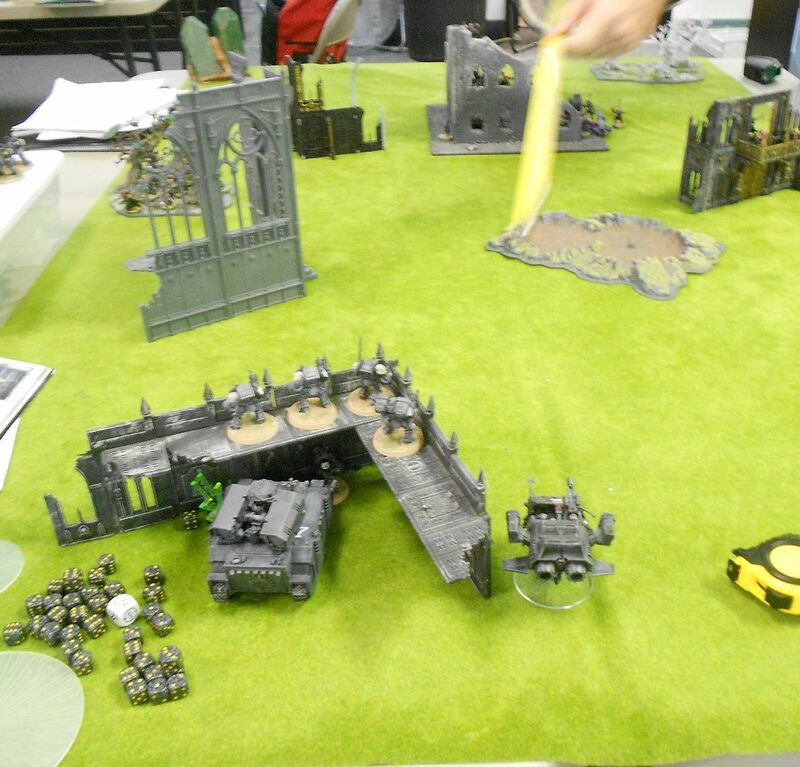 Heavy flamer, assault cannons and stormbolters take them out. 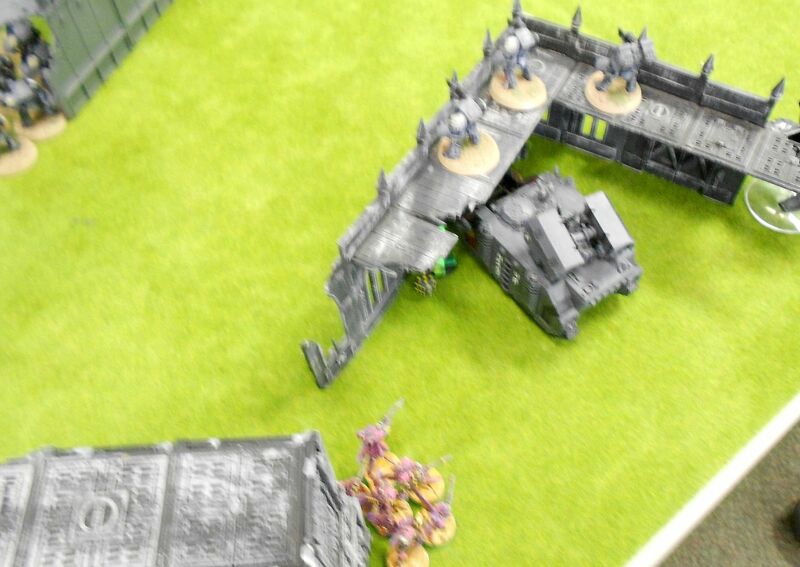 Belial and friends wiped out while rangers break cover to head for top left objective. 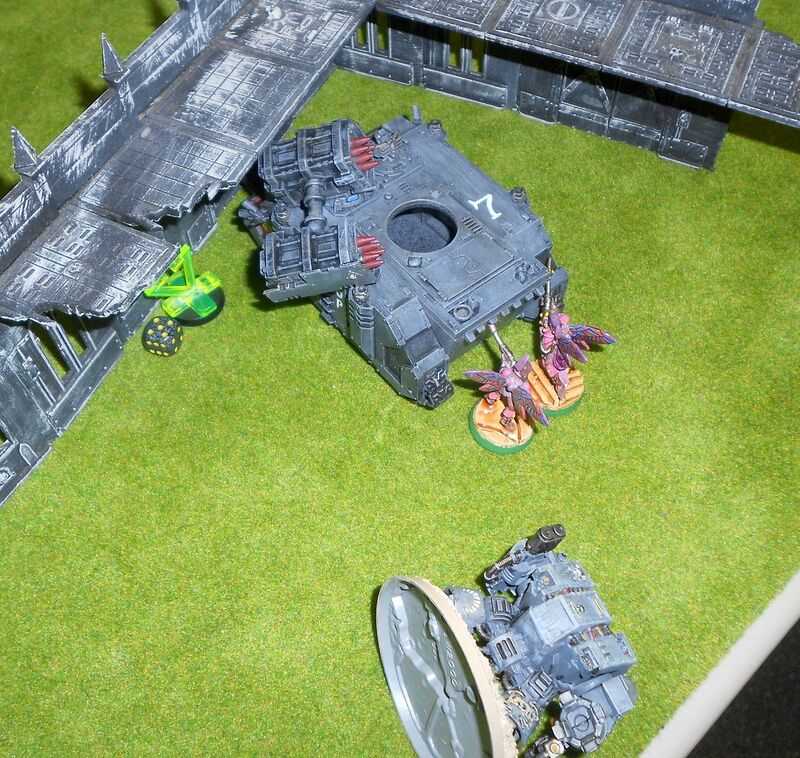 Dread and speeder try to take out some warwalkers and fail. Whirlie scatters off of rangers. Other hawks drop down where first squad did, but are able to battle focus behind the wall after shooting. 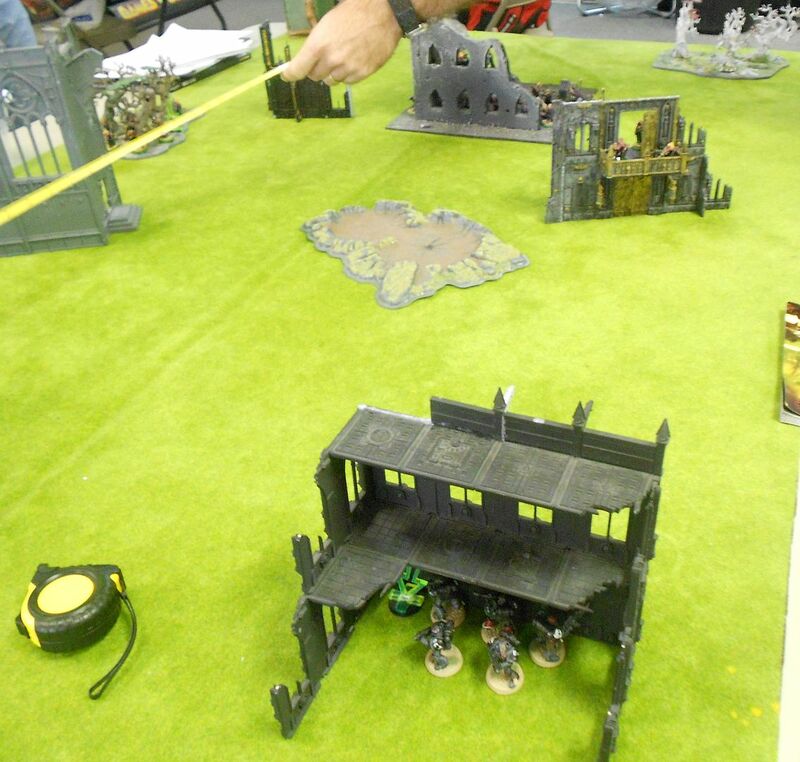 Dread moves back to deal with them, tries to assault but gets finished off by an overwatch-thrown haywire grenade! Surviving hawks (2) move out and assault the whirlwind and wreck it. The lone terminator had also tried to get back downstairs to avoid fire from 90% of James' army. Difficult terrain - 2", can't get down. Run! 2", can't get down. Fudge. 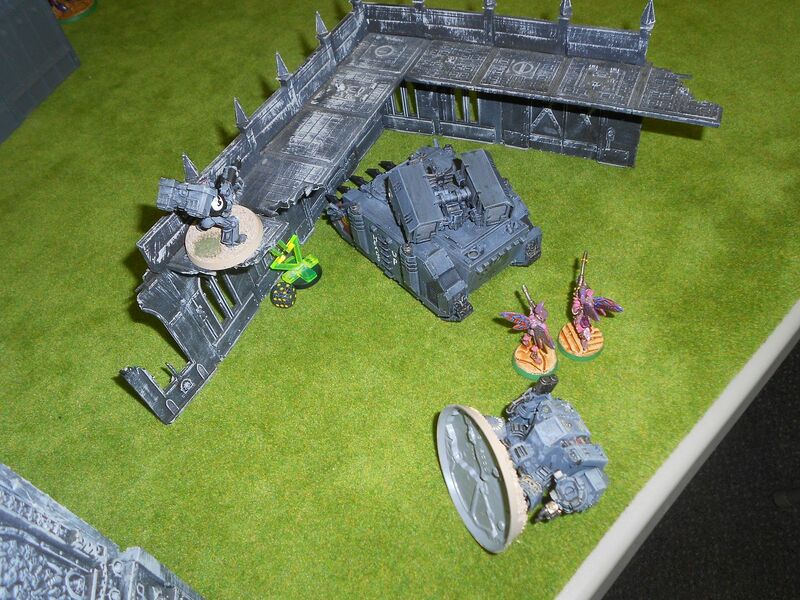 Note absence of terminator in pic after Eldar shooting phase, above. 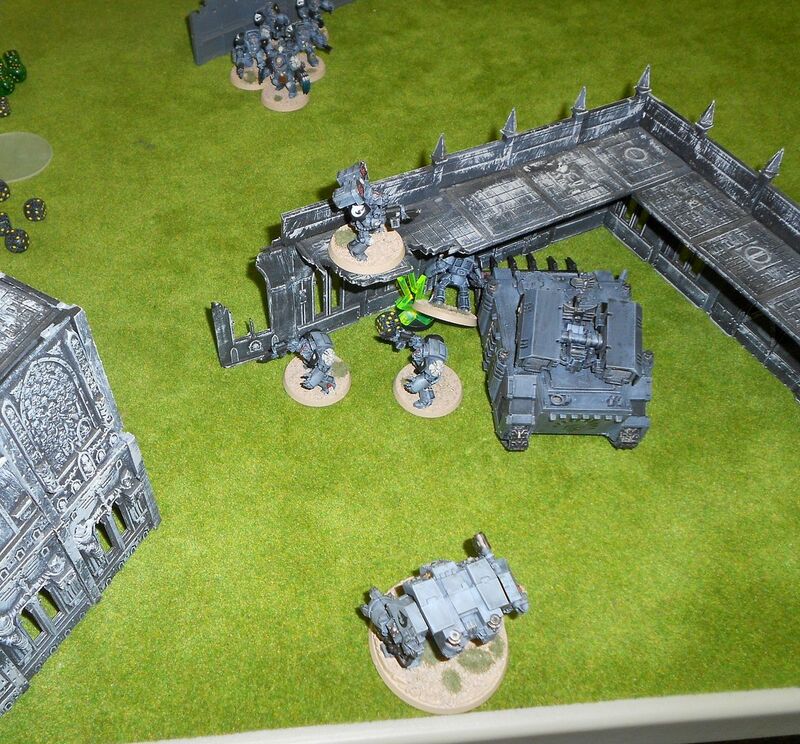 The game went OK for a while, and given the objectives and deployment figured I had a chance. Good move outflanking the warwalkers, better than walking them into my missiles. In the end I was wiped out, so strong win to James who continues his undefeated record in the league so far! I looked at the list and thought"Hey, no wave serpents" and thought you had a better chance but I guess I was wrong. 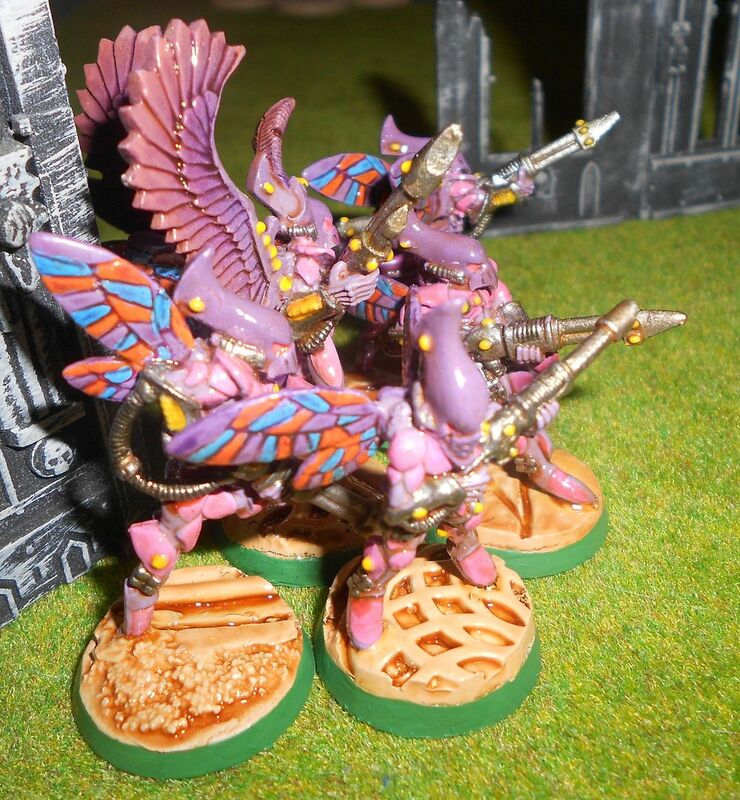 The Eldar can put out so much effective firepower it is unreal. 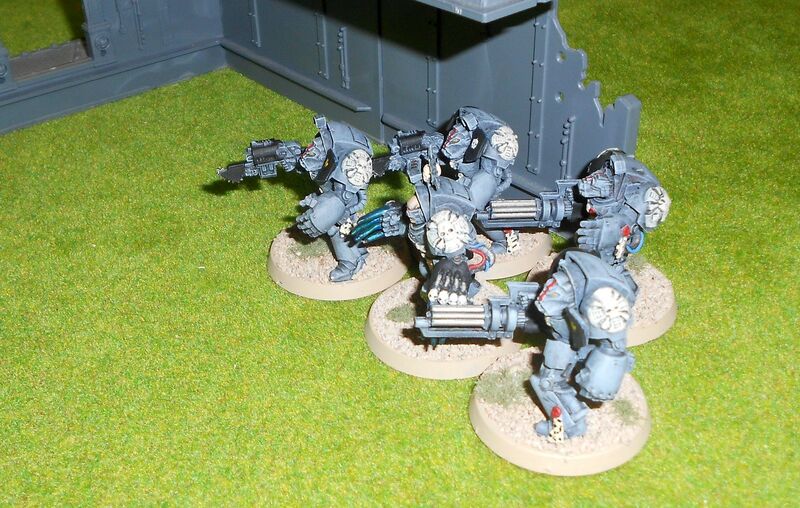 It is especially bad against a low model count army like your terminators. All he needs is a half dozen rends from the snipers or shuriken cannons and you are down a squad. New Chaos Space Marine supplement due soon!